To stand up to the heat and pressure of next-generation rocket engines, the composite fibers used to make them should be fuzzy, say researchers. Their “fuzzy fibers” of silicon carbide act like Velcro and stand up to the punishment that materials experience in aerospace applications. The laboratory of Rice University materials scientist Pulickel Ajayan embedded silicon carbide nanotubes and nanowires into the surface of NASA’s fibers. The exposed parts of the fibers are curly and act like the hooks and loops that make Velcro so valuable—but on the nanoscale. 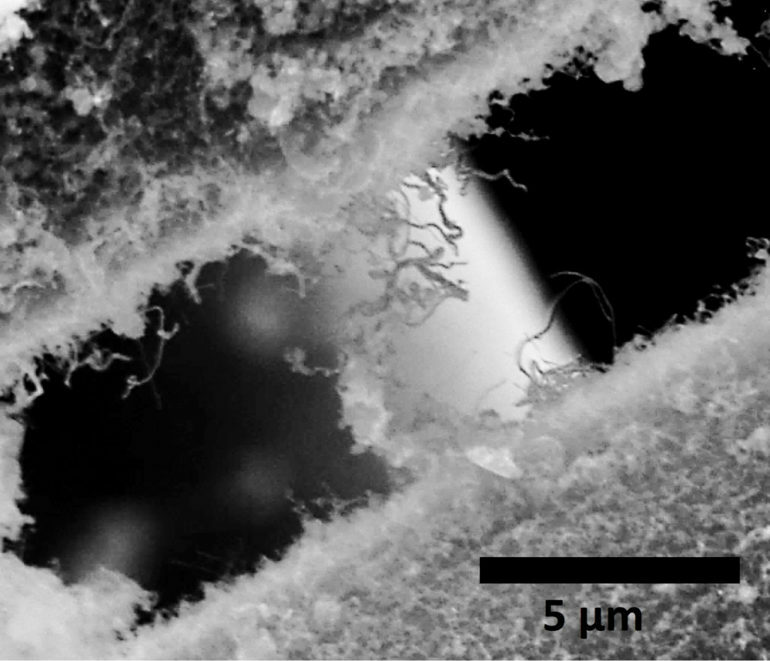 The result, according to lead researchers Amelia Hart, a graduate student, and Chandra Sekhar Tiwary, a postdoctoral associate, creates very strong interlocking connections where the fibers tangle; this not only makes the composite less prone to cracking but also seals it to prevent oxygen from changing the fiber’s chemical composition. Friction and compression testing showed the lateral force needed to move silicon carbide nanotubes and wires over each other was much greater than that needed to slide past either plain nanotubes or unenhanced fibers, the researchers report. They were also able to easily bounce back from high compression applied with a nano-indenter, which showed their ability to resist breaking down for longer amounts of time. Tests to see how well the fibers handled heat showed plain carbon nanotubes burning away from the fibers, but the silicon carbide nanotubes easily resisted temperatures of up to 1,000 C (1832 F). Hart says the next step will be to apply her conversion techniques to other carbon nanomaterials to create unique three-dimensional materials for additional applications. The work appears in Applied Materials and Interfaces. Additional coauthors are from Rice; Hysitron Inc. in Minneapolis, part of Bruker Corp.; and NASA Glenn Research Center. The NASA Jenkins Fellowship and the Air Force Office of Scientific Research through its 3D Multidisciplinary University Research Initiative grant supported the research.